Sunday January 21st 1900 Was busy with the work all forenoon I read all the afternoon and evening. A rather pleasant day Monday January 22nd 1900 Will helped me with the meat we got it all cut up and most of the lard fried. 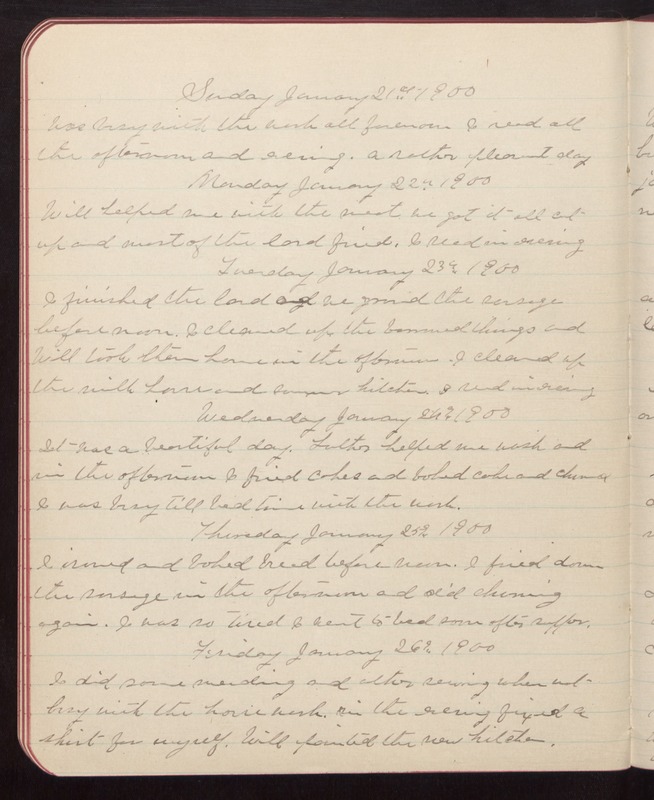 I read in evening Tuesday January 23rd 1900 I finished the lard and we ground the sausage before noon. I cleaned up the borrowed things and Will took them home in the afternoon. I cleaned up the milk house and summer kitchen. I read in evening Wednesday January 24th 1900 It was a beautiful day. Luther helped me wash and in the afternoon I fried cakes and baked cake and churned I was busy till bed time with the work. Thursday January 25th 1900 I ironed and baked bread before noon. I fried down the sausage in the afternoon and did churning again. I was so tired I went to bed soon after supper. Friday January 26th 1900 I did some mending and other sewing when not busy with the house work. in the evening fixed a shirt for myself. Will painted the new kitchen.